I like the Actung Panzer series because of the detailed drawing they provide, the down side is that the text is in Japanese, although the descriptions on the drawings are also in English. 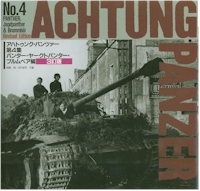 The Sturmpanzer section is actually an add-on to what is mostly a Panther/Jagdpanther volume, Sturmpanzer only has about 16 pages. It has a few period photographs, about 8, along with B/W and color photos of the Aberdeen and Saumur Sturmpanzers, there are also some interior shots of the Saumur vehicle. I do like their line drawings and they are good to indicate many of the changes between version but they like others miss the fact that there where actually 4 versions and not 3 and do not represent the Series 2 version in any of their drawings.